So far this term we have met to relaunch our Child Friendly Anti Bullying Policy with our classes. We are really pleased to say that all of our classmates knew what to do if they thought they or someone else was being bullied and knew how to say STOP! When we come back after the half term, we are launching our first school newspaper! Children from every class will be asked to write something - jokes, puzzles, recipes, craft ideas, book reviews - and we will then interview a member of the staff to find out more about them. We think we will sell the newspaper for 50p and use the money we make to buy some more playground equipment. The newspaper will be posted on the website - so watch this space! 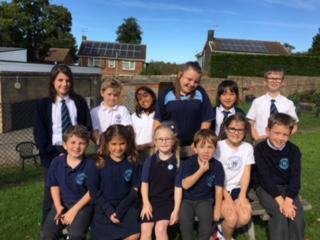 Our school council represented St Mary's Primary School at the Centenary service this year at Carisbrooke Castle.They were joined by local dignitaries, veterans and other local schools for this special service of remembrance.